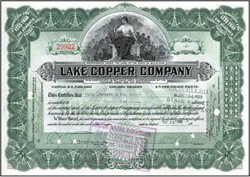 Beautifully engraved Certificate from the Lake Copper Company issued no later than 1926. 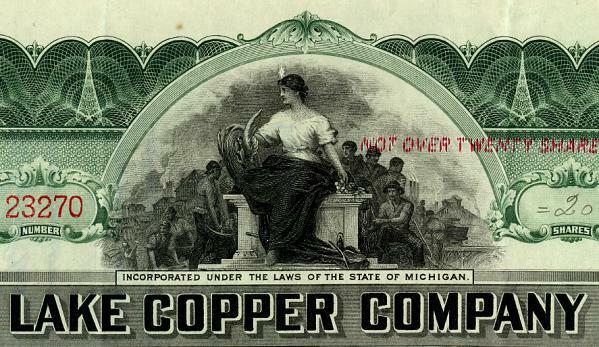 This historic document was printed by the Republic Banknote Company and has an ornate border around it with a vignette of a woman with miners in the background. This item is hand signed signed by the founder of Paine, Webber and Company, William A. Paine. This historic item is over 82 years old. Punch cancelled. William Albert Paine was born on January 29, 1855 in Amesbury, Massachusetts. Early in his career he worked as a clerk at Blackstone Bank in Boston. He was employed there from 1873 until 1880. Formed a brokerage firm called Paine, Webber and Company in 1879 with partner Wallace G. Webber. Married Ruth Felton Ward in 1887, had two sons and three daughters. In July 1879, Charles Cabot Jackson and Laurence Curtis opened a brokerage office on Congress Street in Boston. One year later, William A. Paine and Wallace C. Webber opened their office up the street. When these two firms merged in 1942 to form Paine, Webber, Jackson & Curtis, they had grown to a combined total of 22 branch offices. The firm moved its headquarters to New York in 1963 and was incorporated in 1970. It went public in 1972 with the acquisition of Abacus Fund, Inc., a listed, closed-end investment company. Through the acquisition of Abbott, Proctor & Paine in 1970, E. S. Smithers & Co. and Mitchum, Jones & Templeton Inc. in 1973, and Rotan Mosle Financial Corp. in 1983, Paine Weber, Jackson & Curtis built a strong, nationwide distribution network. In 1977, it acquired Mitchell Hutchins, Inc., a firm that traces its history to 1919 and had evolved to become one of America's leading equity research boutiques. Two years later, Blyth, Eastman Dillon & Co. was acquired, adding 70 branch offices and more than 700 investment executives in addition to a well-developed investment banking capability. Blyth, too, had a long and involved Wall Street history. The firm was founded in San Francisco in 1914 by Charles Blyth and Dean Witter. It was known as Blyth, Witter & Co. until 1928 when Dean Witter left to set up his own brokerage business. In 1935 Charles Mitchell, former chairman of the National City Bank of New York and a director of the Federal Reserve Bank of New York, joined the firm to assist in developing its underwriting and distribution businesses, which were intended to complement the company's established West Coast investment banking operation. Blyth & Co. merged with Eastman Dillon Union Securities & Co. in 1972. Eastman Dillon was a full-time investment banking firm, founded in Pennsylvania in 1912 by Herbert Dillon and Thomas Eastman, which merged with Union Securities in 1956. Union Securities was founded in 1939 to assume the underwriting business of J. & W. Seligman and established a successful track record during the 1940s and 1950s in what is known today as merchant banking: buying up, restructuring, and selling companies. PaineWebber moved its headquarters from 440 Broadway to 1285 Avenue of the Americas in midtown in 1985, and the following year a new complex at Lincoln Harbor in New Jersey became home to the firm's technology and transaction processing operations. In 1995, PaineWebber acquired the Kidder, Peabody Group from General Electric Company. Founded in 1865, Kidder, Peabody maintained a preeminent position in investment banking and private services. Today, PaineWebber is a full-service securities firm serving the investment and capital needs of a worldwide client base. Its principal lines of business include retail brokerage, investment and merchant banking, trading and asset management, each supported by a distinguished research capability and technology support systems. With 17,045 employees (including more than 6,500 investment executives) in 300 offices worldwide and a capital base in excess of $6.5 billion, it remains one of the few major independent, publicly-held firms in the industry. Since its move to midtown in 1985, PaineWebber has been a visible presence on Sixth Avenue. The illuminated name on the building is unique among investment banks, and the ground floor gallery of ever-changing exhibitions is a genuine contribution to the cultural scene. This gallery is also unique among investment banks and is a reflection of the firm's creativity in all aspects of its business.